It caught my eye while scanning the LA Times: Obituary: Moishe Rosen dies at 78; founder of Jews for Jesus - latimes.com Right away, my Jewish genes kicked into overdrive. On cue, the inner dialogue begins: “Jews for Jesus”, my inner rabbi scorned…”not real Jews, nothing more than a cult, something should be done…don’t even associate them with real Jews…” It seems oxymoronic – Jews for Jesus. Jews still peer out our windows with hope, still search for the savior among the homeless on the corner, still practice Tikkun Olam and plant our gardens in the anticipation of the messiah. Jews for Jesus believe that Jesus was the messiah and now needs to come again. Pick one! Are you Jews or are you for Jesus? You can’t have it all. And so the ‘traitor’ box next to his name is checked and I flip the page, secure in my genetic heritage and my right to claim myself as a Jew. But he lingers, roaming around, past the values of faith and mezuzahs marking the corners of my mind. What makes someone Jewish? What are the minimum requirements? What are the course prerequisites for the PhD in Jewish mannerisms? What constitutes a Jewish soul? I know that rabbinic law determines a Jew by the religion of your mother. So is it really so simple? If a mother was born Jewish, never prayed or welcomed in shabbos or braided challah, is her child automatically Jewish? For a religion that dissects every word in the Torah, prints tomes analyzing single sentences, and mandates 100 blessings a day, is it possible that it’s simply genetic roulette to gain admittance into the club? This Moishe Rosen, the founder of Jews for Jesus, was raised in an Orthodox family and married a Jewish woman. While I vehemently disagree with his methods, he did spend his life immersed in certain Jewish rituals and the practice of faith. So what makes me think I'm a better Jew than he was? I don’t go to shul most weeks. I light shabbos candles when I remember. I store my siddur in a bedside drawer, gathering guilt as I notice it without cracking the cover. And yet, I am a Jew. I stand proudly, secure in this heritage, this identity that I carry, this set of beliefs that I subscribe to. My Judaism is a part of me whether I kiss the mezuzah or rush past it. I am more apt to march in a rally for Israel than I am for America, even though I’ve never been to the Promised Land. I keep my anti-Semitism meter turned to extreme, ready to take offense at the whiff of discrimination. I sprinkle my vocabulary with Oys and mazel tovs, keeping gefilte fish and brisket on ready alert. I find a local shul to observe Yom Kippur and fly home for Seder. But there’s a bigger question that I avoid, keeping myself busy with books, cleaning, walking the dog, writing – distractions to remind me not to look too closely at my Jewish failings. It’s the question of faith. The hypocrisy of picking and choosing, selecting the appealing nuggets of Judaism to incorporate while shoving aside the rest of the religion. It’s my religious ADD, where I get caught up in tradition and customs, seeing the beauty and meaning that can be infused in daily activities, but am unwilling to stretch myself to sustain lasting lifestyle changes. I smack into my inconsistencies as I long for a solid belief in a G-d that manages my life better than I do, but yet continue to live a secular life absent of the Jewish markings I am commanded to follow. I yearn for faith, for learning, for meaning in the details but don’t want to be inconvenienced by the rest of the 613 commandments. So am I a real Jew? Is the Hassidic neighbor ranked higher than the reform father? Is merit measured merely by number of commandments followed, number of blessings performed every day? If I go to shul every week, is that enough? Does it count if I listen to torah lectures on my iPod? Do I get extra points for murmuring the Shema at the sound of my alarm clock? What earns me the Jewish gold star? And then I remember that this beautiful religion, this smorgasbord of customs, this symphony of blessings isn’t a race. This business of faith is a journey for me as I attempt to locate what I'm missing and which door I can unlock to make room in my life. I’ve belonged to reform Temples, Conservative synagogues, and Orthodox shuls. I’ve studied with rabbis, debated with students, jotted notes from professors. Judaism values learning as do I, and so I learn how to find the Judaism within, the Judaism that deepens my faith, that sends me home with leftovers of meaning for the next day. I give up trying to define if I'm a ‘good enough’ Jew, if I qualify, if I'm allowed to claim this identity. I give up comparing my observance with hers, my righteousness with his. I remember my obligation not to be the best compared to you, but rather to be the best compared to my highest self. I remember that faith is a personal matter, and while there are abundant opinions and rabbinic prerequisites and tractates galore, belief in something greater than myself can’t be forced or rushed. Faith can’t be quantified or ranked. Faith can only be lived. So I stop defending my lack of observance and cultivating guilt over broken mitzvahs. For today, it’s enough to stay on the path, to keep learning, keep wondering, keep searching for meaning. And in the same breath, I know I could do better. 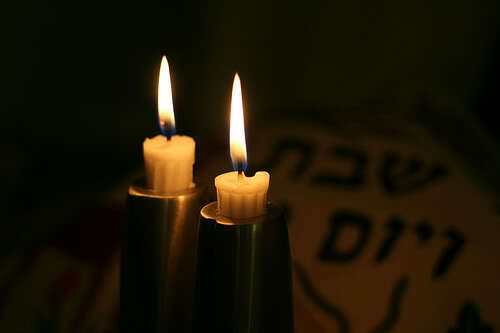 I can take the minute to light my shabbos candles. I brush off my dusty siddur and place it on the nightstand instead of tucked away in the drawer. Maybe it will stay closed, still overlooked in favor of new novels with more exciting plots. But maybe it’s cover will remind me that if I desire a faith that withstands with wind, I must take action, I must be willing to reach out my hand. As for Moishe Rosen, founder of Jews for Jesus…let’s not speak ill of the dead. I’ll try to leave the judgments up to the all-knowing One, and keep my eyes focused on my own choices. So I put away my Judaism checklist and failing report cards, and decide that as long as I still seek a seat in this religion, I have earned the right to say I'm a Jew. Not a good Jew. Not confined by sect, shul, movement, or philosophy. Not a fallen Jew or a ‘Top Ten’ Jew. Regardless of merit or genetics or level of kashrus observance, I am a Jew. It’s the box next to my name I check first. In a complicated world with a complicated brain, I opt for clarity. I am simply Jewish. Sorry I hit the send button by mistake. You should be on a Jewish university lecture tour! It was moving and real and thought provoking and funny and controversial and realistic and really tasted good!! Ha! !